Our latest Half Price Club is deliciously twisted and tastefully squeezed! It's Twisted and Squeezed Food Truck, the bright yellow food truck next to the Big I. 2 $10 coupons for only $10 Bucks (a $20 value for $10) On sale this Thursday, July 12 at 8AM. Come by for lunch and dinner and try their expanded menu items, Pork Loin Rib Tacos, Sweet Potato Swirls and Dee's Ribs or try one of their signature items like the Tornado Potato or the Twister Dog and don't forget a fresh glass of lemonade, with the blueberry or strawberry "squeezer" AND for dessert try one of Judy's cream filled chocolate cookies topped with frosting. 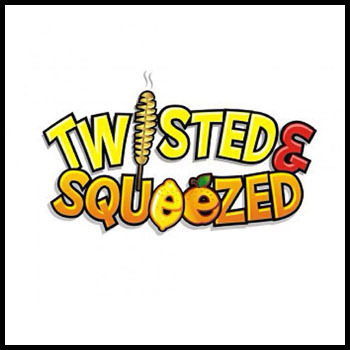 It's all at the bright yellow food truck "Twisted & Squeezed" right next to the Big I downtown. This voucher is good for the 2018 - 2019 summer seasons . Food truck will be closed during the winter months.